Naming things has a new allure for me. Living in a new place can feel like a walking dream, never quite grounded, often confused. Knowing the names for things clarifies them, like a camera focusing so I see in exquisite detail. When I hear about or see something unnamed and from afar, it has less weight or import. Attaching a name and perhaps a story, I incorporate and solidify it, body and soul. It’s not that I don’t enjoy the unnamed sweeping vistas, fields of color, and the more general power of nature. But grasping the specifics gives me texture, context, a deeper appreciation, and an anchor in my new home. 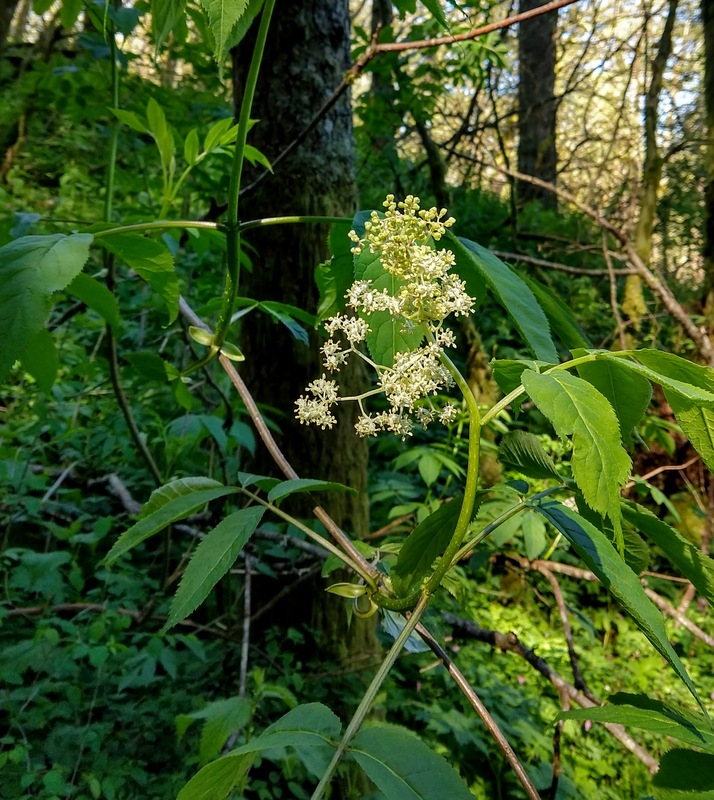 I’ve been trying to learn the names of the flowers in my yard, local wildflowers, trees, and birds. It’s a layer of belonging, making them mine for as long as I can remember the name. As it turns out, the places and things whose names I learn become the ones I’m most fond of. Learning is one thing, remembering is another. When we first moved here I wrote down all the names of the plants in our yard, but I still can’t remember many of them. The things I planted myself have a better chance. The other day my granddaughter asked, “Nana, how do you know the names of so many flowers?” so according to some, I’m doing okay. Usually my local explorations consist of contemplative wanderings followed by chasing down answers to questions at home, and perusing some history and stories about an area. But sometimes I enjoy exploring with people who know more than I do. 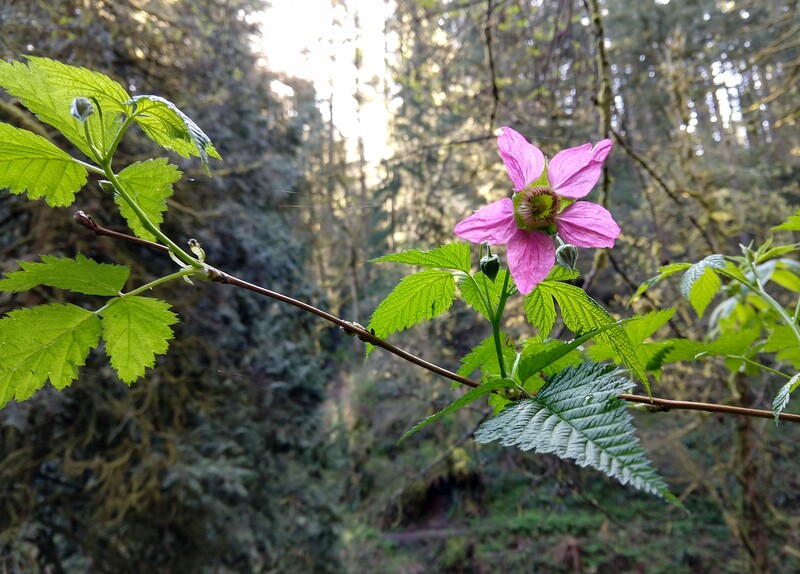 So on a beautiful mid-April morning I drive to Latourell Falls in the Columbia Gorge for a Meetup hiking group. There are 4 women around my age plus an 80 year old hiking machine (growing up outdoors and around horses is apparently good prep for a long physical life.) After a bad night’s sleep I had considered backing out of the trip, seesawing between “I CAN do it all!” and “I’m so OLD,” but seeing that 80 year going strong, I was glad I womanned up. I pronounce the name Latourell Falls like it’s French, LAtoorEL, and everyone looks at me funny. I might as well scream out, “I’m from California!” It’s actually pronounced “lateral” (funny name for a waterfall), and is just one of those place names unique to an area, like Portland’s Couch St. being pronounced Cooch. I’m also gently informed that Lacamas (last week’s hike) is not Spanish, it’s pronounced LACKuhmuss. Using the incorrect vocabulary and pronunciation marks you as an outsider, no matter where you are and where you’re from. Getting these Oregonian pronunciations under my belt is another mark of belonging. To get to the Falls I head east on Highway 84 (The Vietnam Veterans Memorial Highway), a scenic high speed dash, then turn onto the parallel Historic Columbia River Highway, a picturesque ramble. This peaceful stretch, 75 miles long, was completed in 1915 as part of the nation’s first “recreation reserve.” Landowners gave parts of their riverside holdings to create rest stops along the way, and their names are engraved on plaques for eternity (or until someone figures out they’re scoundrels). Sam Hill, the highway’s visionary, said, “Good roads are more than my hobby, they are my religion.” He had an eye on tourist dollars as well, and according to a signpost, also said, “We will cash in, year after year, on our crop of scenic beauty without depleting it in any way.” Thankfully, there’s little commercialization, but being public there’s inevitably destruction and mistreatment, not least of which was the 49,000 acre Eagle Creek fire last fall, started by teens who thought firecrackers in the dry woods would be fun. It took three months to put out, and much of the beloved Gorge is still closed. Latourell Falls is one of the few areas still open for hiking. Contortionist tree, what was it thinking? The Gorge is a mix of private property with state parks and national forests, and not all landowners are good stewards. Clear cutting and water pollution affect the downstream waterfalls and creeks that flow through public lands and into the Columbia River. Similar to other areas I’ve visited, efforts to preserve the environment are ongoing and complicated. But to the casual observer, it’s just stunningly gorgeous. With moss types numbering in the thousands, I won’t be learning their names any time soon. Latourell Falls plunges 100 feet down the side of a rocky mountain above, visible from the parking lot if you want to just stop for a minute. 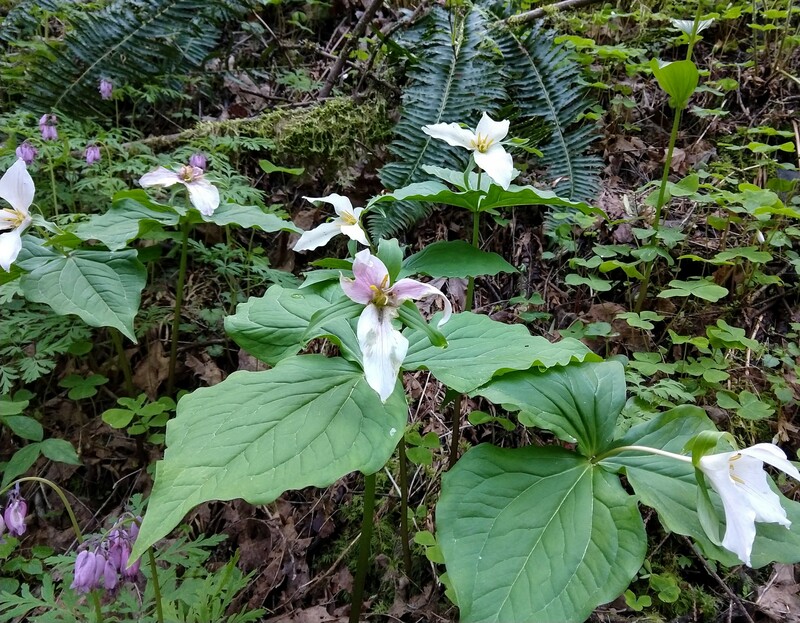 The area is magnificent in the springtime, just as my Lacamas Creek hike was a week earlier. 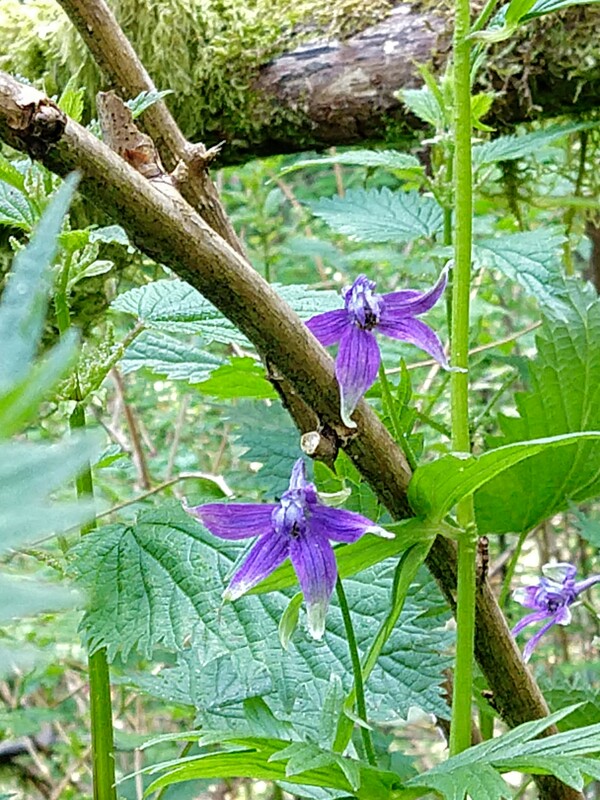 With a wealth of flowers, new growth and full creeks and falls, Spring is clearly the best hiking season here. The trail is a fairly easy 2.5 mile loop with a few muddy, slippery climbs and descents. 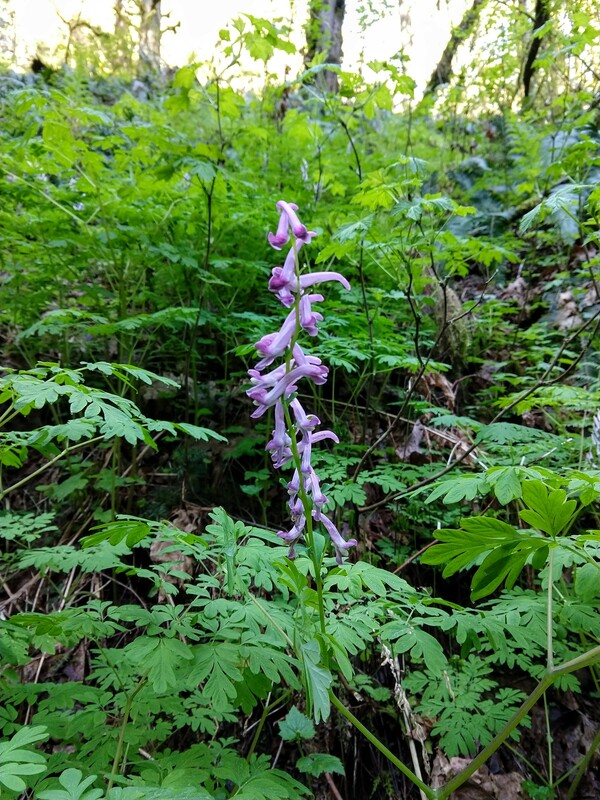 I’m hiking with a woman who belongs to “Friends of the Columbia Gorge” and has explored much of the area, plus our well-informed organizer, so as well as being social, this is a learning walk, and answers to my questions get quick responses. They don’t know everything, but they know more than me. Following the creek to the upper falls further in, we stop often to consider the fantastic number of wildflowers along the way, and since most species have subspecies and appear differently in different areas, there’s some debate over names. 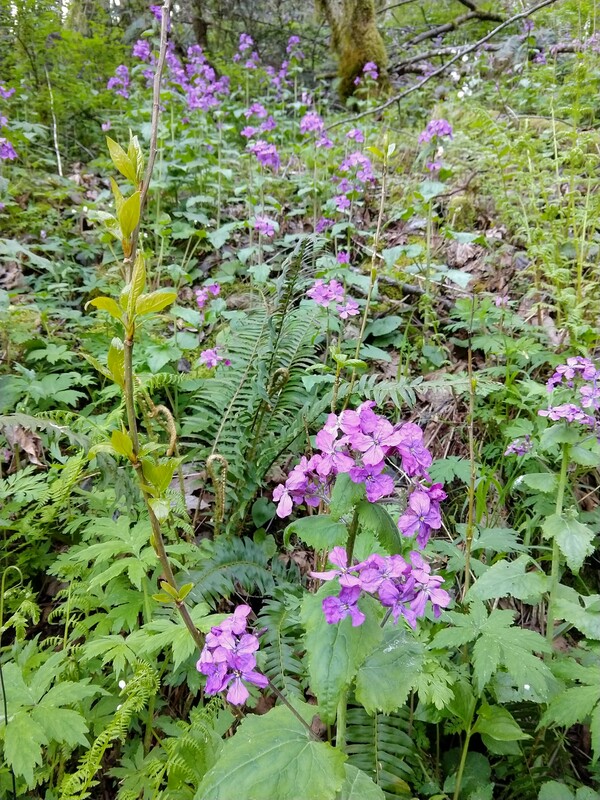 Roadsides and trails teem with showy purple flowers, washing the hillsides in colored swaths reminiscent of Lupines in the Sierras or Texas Bluebonnets. 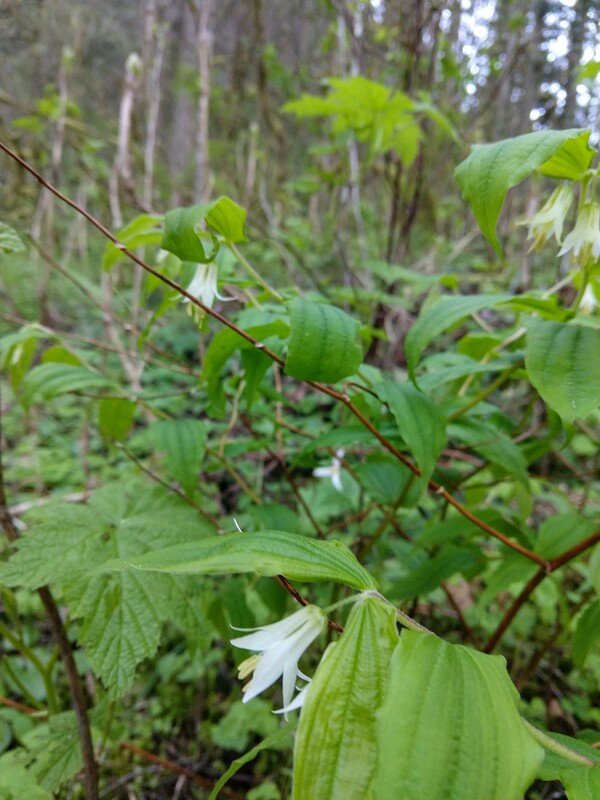 I learn they are Native Bleeding Hearts, and later I begin seeing them all over Portland. How does that work? 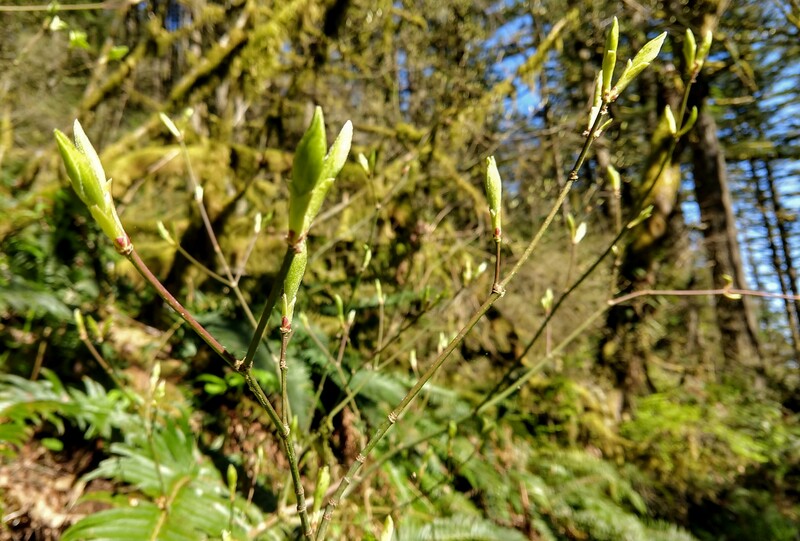 Were they blooming before, unnoticed, or did they just pop up the same day I saw them in the Gorge? Such power in a name! 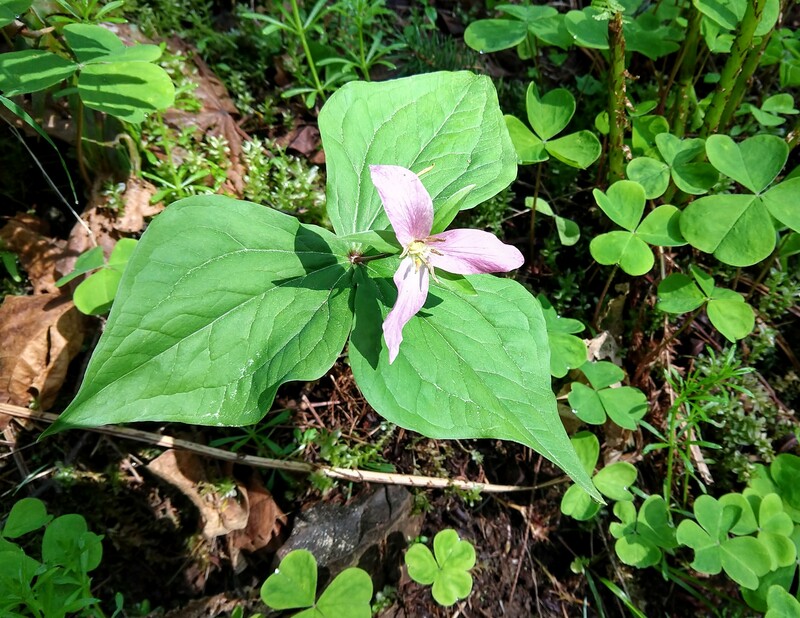 Trilliums are profuse and lovely for a short time every spring, and are one of the first local flowers I learned to recognize. I thought some are white and some purple but today I find out they start out white and turn purple with age, making them even more magical. I also learn the glowing and glamorous white blossoming trees covering Portland right now (along with the pink blossoming cherry trees), are flowering pear trees. Aha! Another drop in the bucket of Things I Know About Portland! The Historic Highway’s concrete braced spandrel deck arch bridge, prettier under than on top. Our hike winds back to a view from underneath a beautifully designed Historic Highway bridge. From there we stand at the foot of the falls, a full body experience, water pounding down, noisy and furious, slamming onto rocks in the pool below, and rainbows in the mist as the sun cast sparkling rays from the side. I’m continually fascinated by the basalt layers and columns around Oregon, formed by lava, ash and mudflows. A few miles up the road we take a brief second hike at Bridal Veil Falls, another stunning immersion in a watery world. I wonder about whether the grandkids could do these hikes, but as I watch the 80 year old scramble up and down stairs and paths with no rails, I have my answer. Since I live on the opposite side of Portland I don’t get out to the Gorge often, so I continue on alone driving east, taking notes for my next exploration. The wide majestic river is a lovely driving companion, wildflowers line the roads and hillsides, it’s a gorgeous day, and I have nothing to do and nowhere to be. Gorge and gorgeous come from the same Old French word meaning ‘throat’. This Gorge is well-named both for its beauty (think something beautiful enough to hang on a throat, as a necklace) and the image of the throaty canyon of water traversing the land. Now you know. The forest is crisp around the edges from the recent fire, so reminiscent of Santa Barbara burn areas. I pass the Bonneville dam (and hatchery), also closed due to the fire. It’s the first built and westernmost of 11 dams that tame the Columbia. This isn’t the river the Indians or settlers first found, but a quieter, more navigable river. Stories of settlers negotiating undammed falls and rapids in steamboats is hair-raising. The Bridge of the Gods, 30 miles up the road, draws me on with its magical name. Once an ancient Indian crossing over the river, it’s a distracted traverse, narrow and undivided, with spectacular views. I’ll be back to explore the Cascade Locks and the visitor center with an underwater window – and claim the area as mine, less mysterious. I return west on the Washington side, stopping at Beacon Rock. I understand the name as soon as I see the towering monolith on the northern edge of the Gorge. It was certainly not named for a Mr. Beacon. I stand at the bottom in admiration, pay homage to these remains of a once volcano, and then jump back in the car, ready to be home, ready for another gorgeous trip, yet to be named. P.S. Here’s a link to some Gorge info I liked. Construction had me stuck on Highway 14 for about 15 minutes. I didn’t mind at all. The joys of retirement. You are living the dream. I am, I hope you are not too far from partaking in that dream!